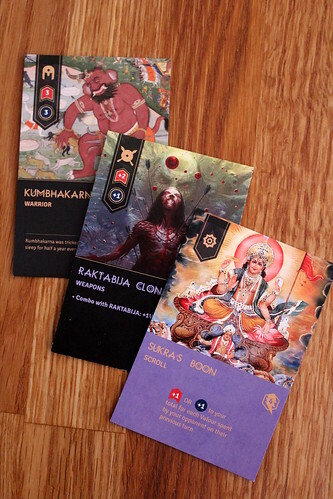 We have recently received an inconspicuous letter in the Meeple Cave that, upon opening, revealed two decks of cards: the preview set of Maha Yodha, a new card game that is currently on Kickstarter. Before we even started playing, one thing stands out: Maha Yodha is gorgeous. The card backs are luxurious in gold on black and white, the fronts show a mix of traditional Indian Pattachitra painting and modern fantasy illustrations on borderless cards. 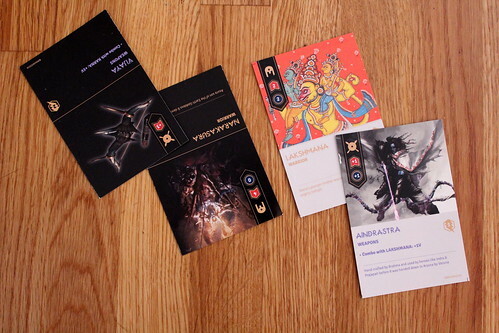 Those are cards that make you want to try the game. Maha Yodha is set in the rich and colourful world of Hindu mythology, a setting that hasn’t been much explored in games yet. Legendary warriors wielding equally legendary weapons stride into combat against one another, seeking victory by reducing the other players health to zero. You play Maha Yodha like many other collectible card games, which Maha Yodha might become with an expansion or three: when it’s your turn, you play cards from your hand, those cards then attack your opponent and, hopefully, take some of his precious life away. Then the other guy does the same to you. The cards you play come in three flavors: Warriors are the ones doing the actual hitting of people. They are mostly there for their Attack and Defense values, but they may have special abilities as well. You can equip them with Weapons which, again, have Attack and Defense values they add to their wielder’s. Scrolls are the third type of card, they work as spells with a wide range of special effects, from dealing damage to kidnapping opposing warriors. You will notice that, unlike pretty much every CCG out there, Maha Yodha does not include any sort of resource cards to pay for your other cards. That’s because your resources are fixed, each round you have five Valour to spend on playing cards. You can sometimes squeeze out another point by playing a matching combination of Warrior and Weapon, but that’s usually it. So your options per turn are limited. To make matters worse, nothing in this game is persistent. Scrolls are discarded at the starts of your next turn, Warriors and Weapons go back to your hand. So if you want them to attack again, you have to pay the cost again. The cards coming back to your hand has another downside: you only draw cards after you pick up your old ones, and you only draw up to five cards. As long as you play Warriors and Weapons, you’re not going to see any new cards from your deck. But discarding them hoping to find something nicer is a risky proposition, you might end up with no Warriors to defend yourself. So what you mainly discard are Scrolls, hoping to find something more useful. This “active drawing” mechanic forces you to make decisions about what you are willing to give up in order to maybe gain something better. But it can be frustrating if you keep drawing even less useful cards. The fixed resources and non-permanent warriors eliminate the runaway leader problem that many other CCGs have to some degree: once you are behind there, you stay behind. Not so in Maha Yodha, where every round is completely new. But it’s not all gold here, either: a player holding a strong Warrior/Weapon combination has little incentive to shake up his strategy, he can simply play the same cards every round and eat away at your health. And those cards are hard to get rid off. There are Scrolls that can discard a Warrior or even steal an opposing warrior to your hand, but they are rare and you won’t always have them when you need them. This can sometimes lead frantic discarding of whole hands, desperately hoping that you’ll draw a card to protect you from the bad man with the big club. So there is some luck involved in playing Maha Yodha, but despite that it’s a very enjoyable card game that does not feel like other CCG style games, that is very easy to learn and that, I don’t mind repeating that, looks amazing. The Kickstarter campaign is already fully funded, but there are stretch goals yet to unlock, and contributing on a level that will give you a copy of the game is quite inexpensive, too.